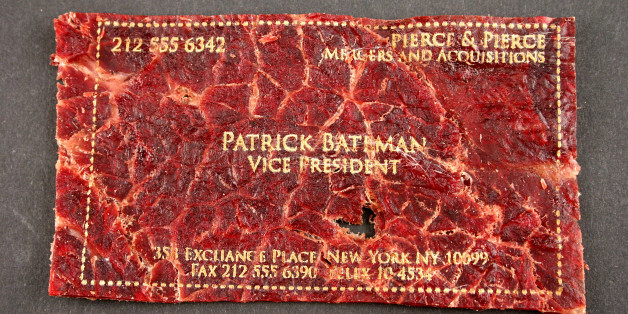 An inventive business card created by the aptly named Meat Card company may hold the keys to your next job. The company is selling laser-etched beef jerky cards on 2-by-4-inch slabs of delicious dried meat. What better way to entice a future boss than with the alluring scent of beef jerky, eh? These cards will certainly stand out among a sea of mundane white cards, at least that's what Meat Card founder Chris Thompson is hoping. “There’s no real use for it except for one upping someone who has a regular paper card,” Thompson told TIME. The beef jerky business cards measure 2 inches by 4 inches. As you can imagine, burning 12-point font onto meat isn't easy. “It’s tricky because jerky is not the best medium,” Thompson told TIME, noting also that the dried meat “is full of holes, and it falls apart” during production. Once finished with the laser treatment, the cards should be edible for up to one year, but Thompson doesn’t recommend taking a bite out of his business. “The jerky is not intended to be eaten. It’s a novelty,” he told TIME. According to Meat Card’s website, pricing is negotiable. Gothamist, however, reported that a set of four cards goes for $25, and there is a standard $5 shipping fee. So if you already have some extra cheddar in your wallet, why not add meat? Inside the beef jerky card-making lab.